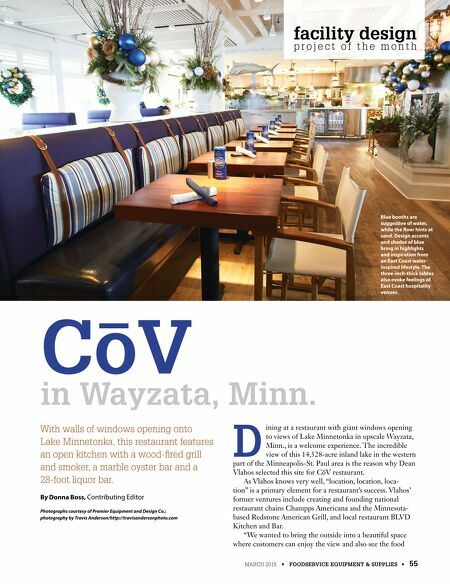 MARCH 2015 • FOODSERVICE EQUIPMENT & SUPPLIES • 55 CoV in Wayzata, Minn. D ining at a restaurant with giant windows opening to views of Lake Minnetonka in upscale Wayzata, Minn., is a welcome experience. The incredible view of this 14,528-acre inland lake in the western part of the Minneapolis-St. Paul area is the reason why Dean Vlahos selected this site for CōV restaurant. As Vlahos knows very well, "location, location, loca- tion" is a primary element for a restaurant's success. Vlahos' former ventures include creating and founding national restaurant chains Champps Americana and the Minnesota- based Redstone American Grill, and local restaurant BLVD Kitchen and Bar. "We wanted to bring the outside into a beautiful space where customers can enjoy the view and also see the food With walls of windows opening onto Lake Minnetonka, this restaurant features an open kitchen with a wood-fred grill and smoker, a marble oyster bar and a 28-foot liquor bar. By Donna Boss, Contributing Editor Photographs courtesy of Premier Equipment and Design Co.; photography by Travis Anderson/http://travisandersonphoto.com facility design p r o j e c t o f t h e m o n t h Blue booths are suggestive of water, while the foor hints at sand. Design accents and shades of blue bring in highlights and inspiration from an East Coast water- inspired lifestyle. 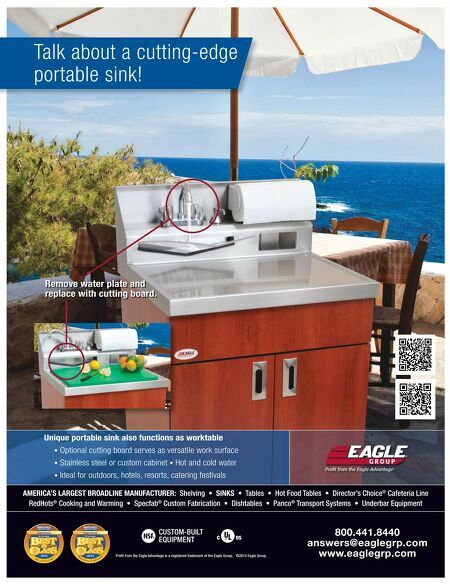 The three-inch-thick tables also evoke feelings of East Coast hospitality venues.